Lynch Creek Dahlias: Lynch Creek, Olympia Farmers Market are BUSY! Customer Linda Shrum shows off her selection of new dahlia tubers. 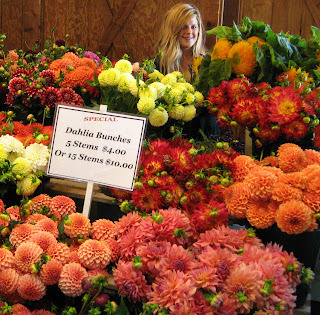 It's the ideal time for planting dahlias in the South Puget Sound area of Western Washington, and the Lynch Creek Farm booth at the Olympia Farmers' Market is selling dahlia tubers hand over fist as gardeners prepare for the new dahlia season. tender new plant starts, produce, meats, fish, dairy products, baked goods and fresh eggs. You can enjoy Indian, Chinese, or Bavarian cuisine or local seafood specialties at tables under cover while you listen to live music. Browse for seeds and salsas, artisan jewelry and lathe-turned wood items, handmade soaps and handmade papers, fruit trees, perennials and, of course, top-quality dahlia tubers. Cut dahlias are spectacular in late summer at the market. The crew from the Farm will offer dahlia tubers at the market through late May. You'll find colors from lemon yellow through the warm tones of bronze, apricot, peach, pink and red all the way to purple and lavender, with forms from petite pom pons to dinner plates. Whoever's manning the booth will also provide helpful growing information; just ask. After a break for tending the growing dahlia plants, Lynch Creek will be back at the end of July when the first cut flowers are ready from the dahlia fields. From then until frost, you'll find luscious colorful dahlia bouquets and an assortment of other flowers (statice, zinnias, and golden sunflowers) in ready-made bouquets or by the stem so you can create your own combinations.